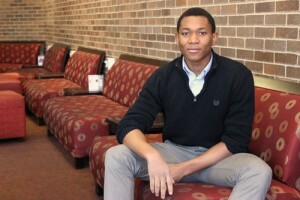 Last December, biology major Michael Bamimore was awarded the Arts and Sciences Dean’s Undergraduate Research Fund Grant. He also received the Best Poster Award for his presentation at the Rutgers–New Brunswick Microbiology Symposium this past January. His project, “Physiological properties and synthesis of the Caulobacter crenscentus stalk,” required five months of research. His research strives to understand the stalk growth and properties of the gram-negative Caulobacter crescentus. Balancing logic, research, and compassion, Michael ultimately desires to be a neurosurgeon in order to help save lives; deepening his understanding of biology also helps him pursue his passion for aiding others. “It was exhilarating,” Michael says about his presentation. He admits that he was nervous when he first presented his project, but soon got used to presenting and enjoyed himself. The symposium was not just for undergraduates, but for scholars from many different backgrounds, many of whom assured him that he was headed for success. Michael originally attended Fairleigh Dickinson University, but the experience there did not propel him to where he envisioned himself. “I wasn’t doing so well there,” he says, “[Transferring to] Rutgers–Camden was one of the best choices I ever made in my life.” Although change is not always easy, Michael stayed positive. “The transition was rough, but I had help… my peers were willing to help me.” Michael is also a member of the Phi Mu Delta Fraternity, which also provides him with a sense of community and support. Michael is currently a Patient Safety Aide at the Clara Maas Medical Center in Belleville, New Jersey, where he has worked for two years. 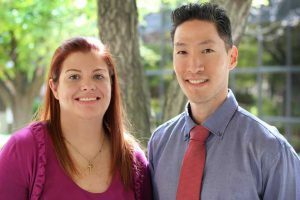 He says that he spends a lot of time with patients, forming connections with them, talking to them about their lives and problems. Michael would like to eventually return to Nigeria and establish a hospital so healthcare can be available to the ones who need it most. In Nigeria, majority cannot afford even the barest of essentials, let alone healthcare, and he wants to inspire other people to make a difference. “I am the type of person that looks toward the future, to help people…I want others to know how important it is to believe in yourself. Be determined.” Before that dream comes to life, Michael plans to take a year off working in a lab, and then nothing will stop him from attending medical school. “Only ten more years to go,” he says with a smile. Page last updated by Department of Biology at 12:30 pm August 28, 2018 . This page was printed from http://biology.camden.rutgers.edu/2015/03/26/michael-bamimore/ at 6:48 AM Sunday, April 21, 2019.